Michael Schumacher has been an Omega Ambassador since 1995. 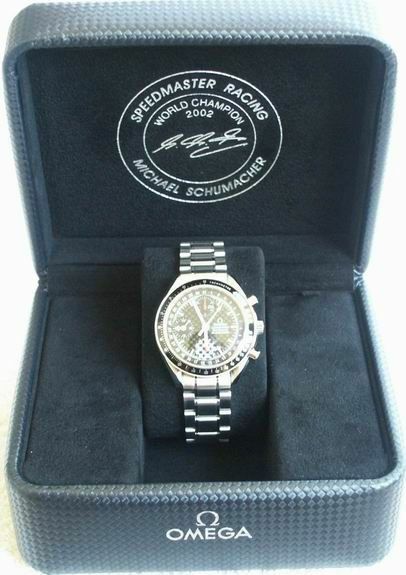 This page tries to cover the various Schumacher watches that are/were available. You can either Click on one of the following pictures to skip directly to the relevant section or simply scroll through the page. As with all web-pages I write, click on most pics for a larger version. Most people would start with the red version, but since I owned a yellow version, I've started with that one. I can show you more pics too ! 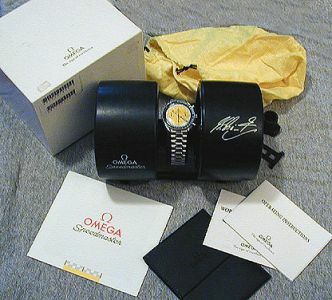 This watch was available new from 1996 till 1999. It ( & the red version) was unvieled on 22 July 1996 by Michael Schumacher at his go-kart track in Kerpen, Germany. It was NOT a limited edition & is not marked so. 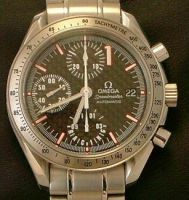 Any auctions you may have seen claiming this are wrong. 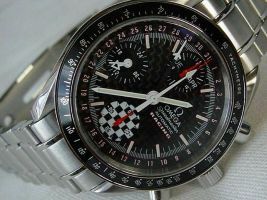 It is basically a Speedmaster Automatic ( reduced ). 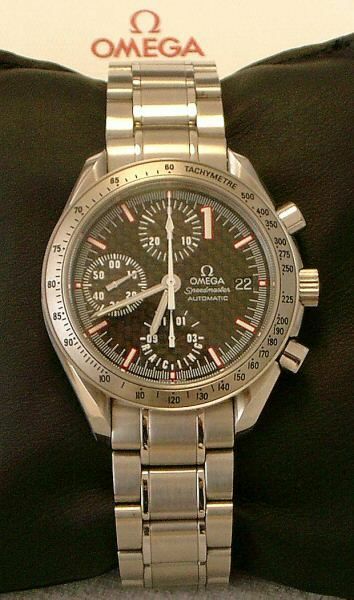 The dial, hands, strap & packaging are all different from the standard reduced. 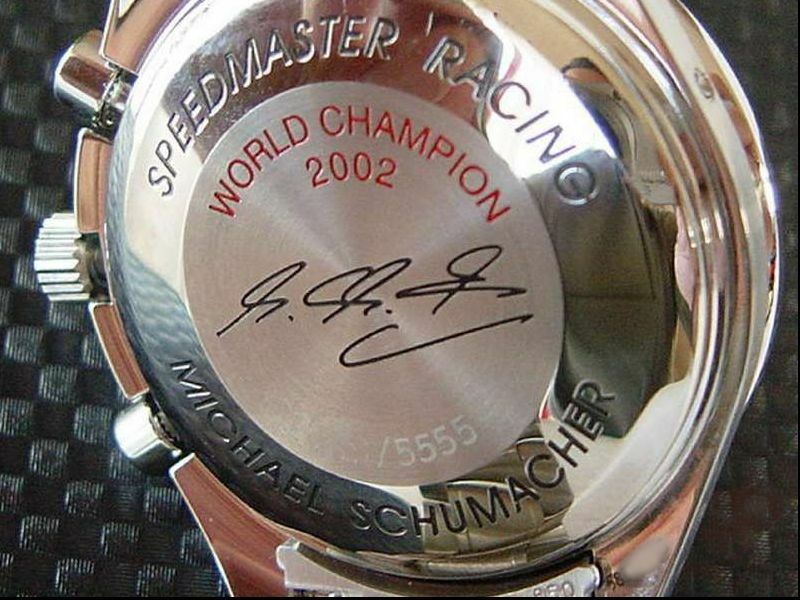 There are absolutely no Schumacher markings on the watch itself. 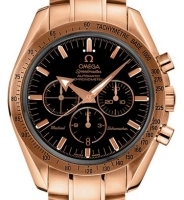 It is powered with an automatic 1141 movement (technical details see below). The watch has a Hesalite (plastic) crystal and a snap-on back. 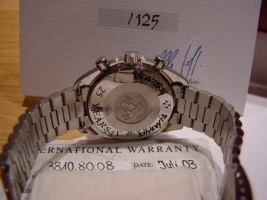 The movement serial number is stamped on the outside of the rear cover & NOT on the movement itself. 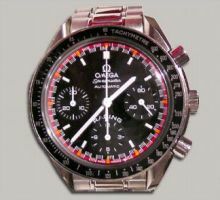 The watch , initially, appears identical to the "normal" Speedmaster Professional. However closer inspection shows a number of differences. 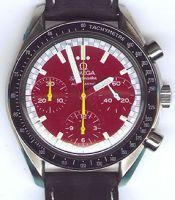 Ignoring the colour, The dial is marked "AUTOMATIC" & not professional. 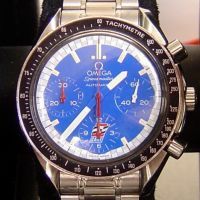 The constant second hand is in a sub-dial at 03:00 ( it is at 09:00 on the professional ), so this means the chronograph minute counter is at 09:00 (it is at 03:00 on the professional). The picture above was borrowed from eBay"
This watch is powered by an 1141 Automatic movement. 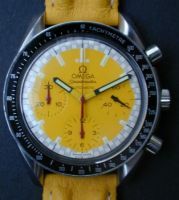 You could have bought this watch with either a stainless steel bracelet or matching double ridged yellow leather strap. I don't have a clear picture of it on the bracelet, but you can just make it out in one of the pics above. 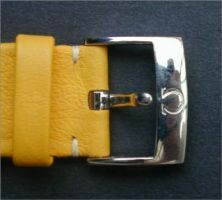 Here are some pictures of the leather strap & buckle. The lug width on this watch is 18mm. Lets start with the boring stuff. The Paperwork. 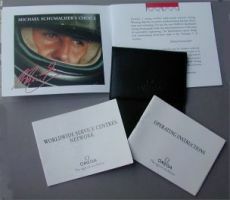 The complete package included, a generic operating instructions booklet ( a small booklet, describing a number of movements ), a "worldwide services network" , A Card booklet printing some text from Michael Schumacher in various languages AND a folded card that explains how to use & care for the tyres. 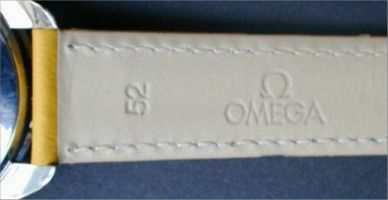 This was all kept in a soft leather type black wallet (with the word Omega & the Omega symbol embossed on the front flap). The warranty card is in the credit card type ( no picture ). The packaging is great ( personal opinion there ! ). It takes the form of a pair of racing wheels & tyres. 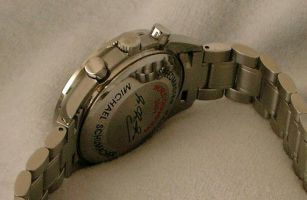 These can be pushed together, to hide the watch, or pulled open to display it. To stop the tyres rolling there is a small stand. 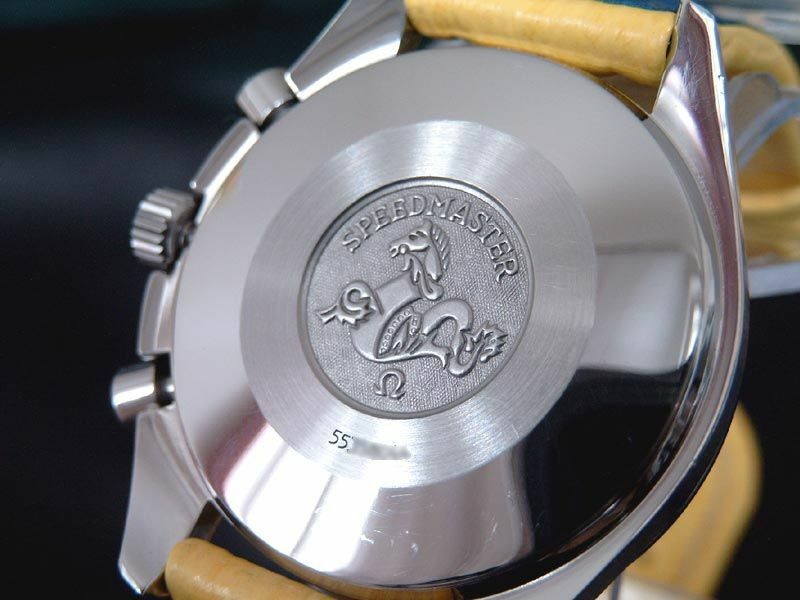 For the versions on a bracelet, there is a small "wheel nut spanner" which enables you to remove a wheel ( See below in the "red" section ), thus allowing you to fit the watch inside the tyres. 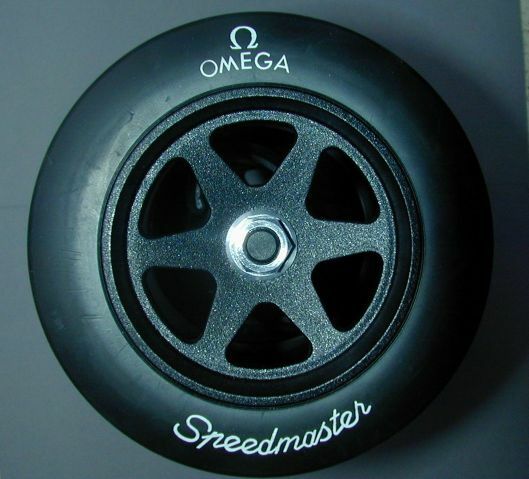 The left tyre was marked "OMEGA Speedmaster" & the right tyre has Michaels signature on it. There is a yellow cloth bag to put the tyres in & all of this came in a protective white cardboard box. I have seen it suggested that putting the watch in the tyres & rolling them around the room, would be a good way of keeping the watch wound & saving you buying a watch winder. MMmmmm OK ! 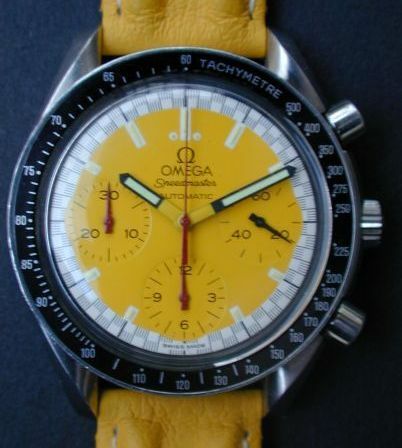 I'm not going to bore you with details about my opinions of the watch, its accuracy, build quality, how many women started conversations with me because of the watch etc etc. 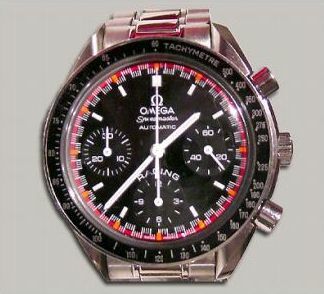 All I will say is that I HAD one & sold it, because it was too small for my wrist. 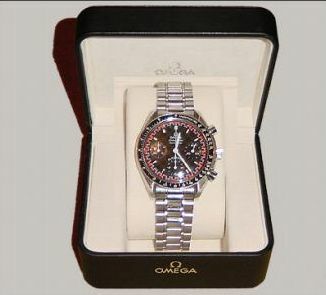 99.9% of what I wrote about the yellow watch, papers packaging etc etc above applies to this watch. 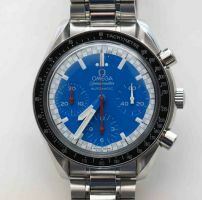 The pictures above were borrowed from eBay"
Although this is a perfectly legitimate watch from Omega, I don't think the Blue watch was a "Schumacher" watch. I present my arguements below in the Cart section. 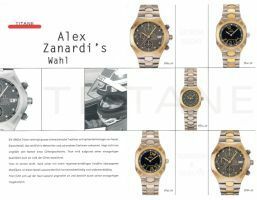 The 2000 edition was numbered & limited to 6000 pieces of which 4000 had a black dial & 2000 had a white dial ( the numbering was not sequential for black & white dials, they were mixed in with each other). There were red/orange chequered markings around the outside of the dial & the word RACING appears above the sub-dial @ 06:00. 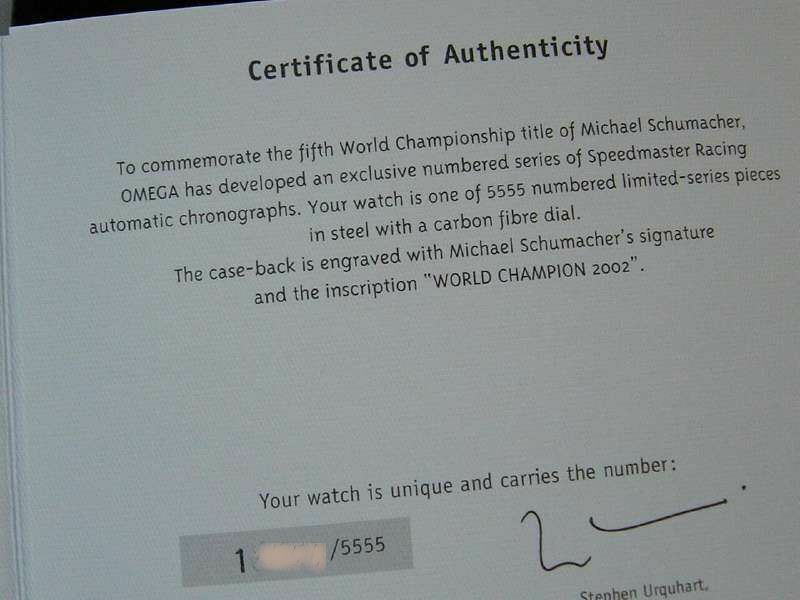 It has a "snap-back" & is engraved with Michael Schumacher nonclemanture and the edition number, as well as his signature. 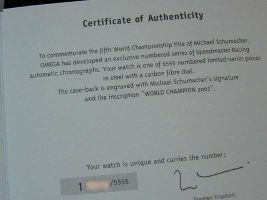 This is the first watch to have been marked as a "Schumacher"
Again this was watch was available on a bracelet or strap (black). 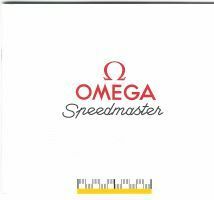 The box was more like a "normal" Omega box, but in black with 'Speedmaster Reduced Limited Edition' and 'Omega' on the top. 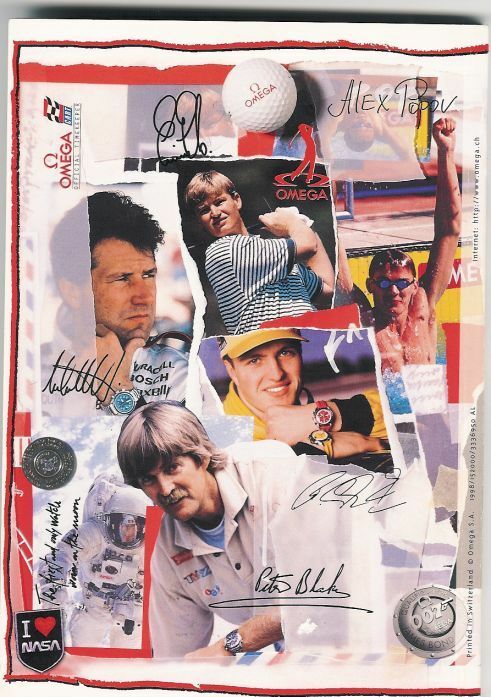 All the above pictures were borrowed from eBay"
The 2001 edition was numbered & limited to 'only' 11,111 pieces. This version has a saphire crystal and carbon fibre dial. 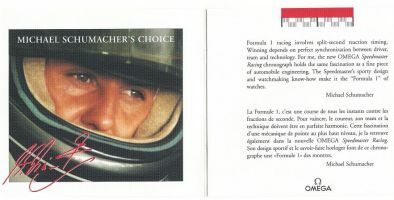 The hours markers are indices except for a large number 1 @ 01:00 & this time the word RACING appears below the sub-dial @ 06:00. The case rear has similar markings to the 2000 edition and the packaging is similar too. 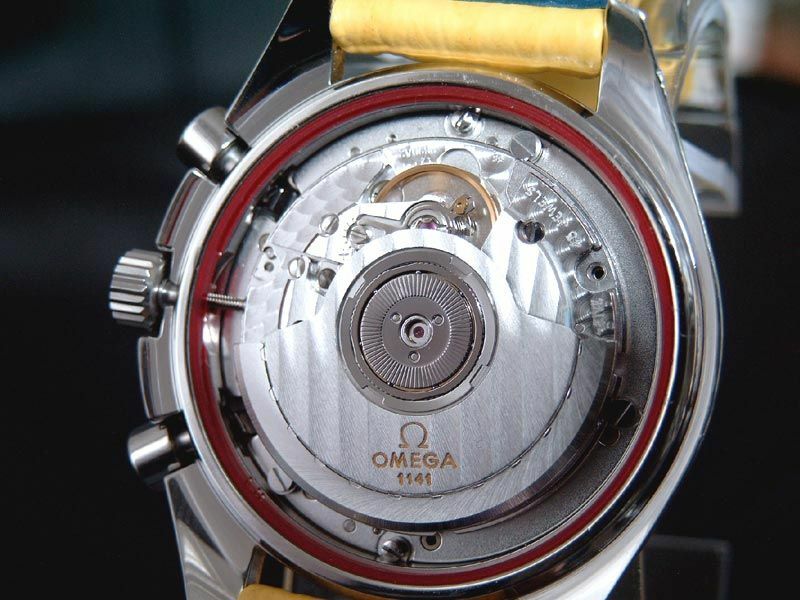 The 1152 automatic movement is based on the 7750 without a day function. 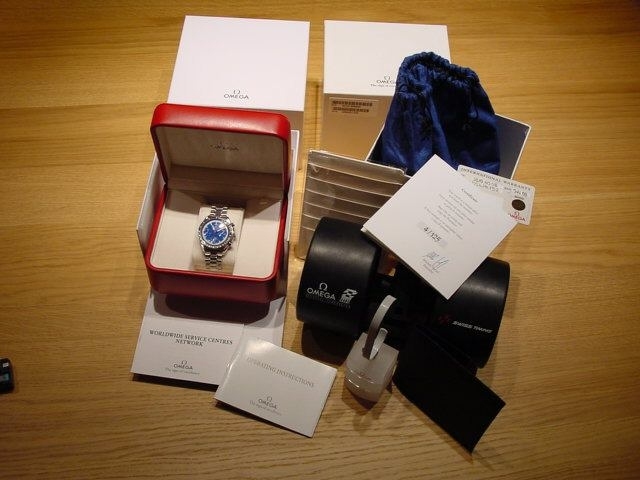 The 2002 edition was numbered & limited to 5,555 pieces. This version has a saphire crystal and carbon fibre dial. 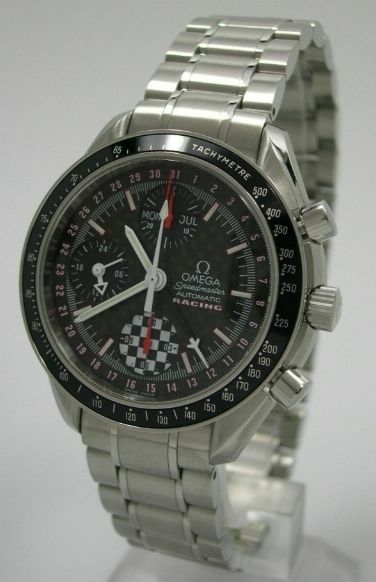 Again the dial is made of carbon fibre & this time the word RACING appears below the other text @ 03:00. The case rear has similar markings to the previous 2 years and the packaging also looks like it is made of carbon fibre. 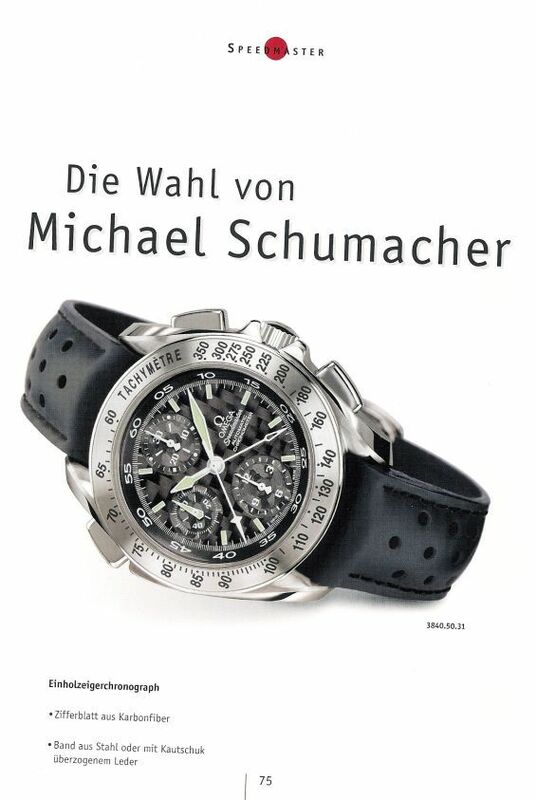 This is a completely new Schumacher watch. Available only in 18ct. 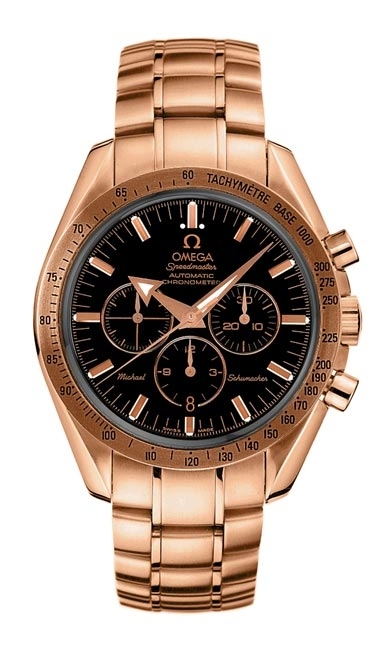 red gold with either a matching bracelet or blackleather strap, it features a black dial, sapphire crystal and was powered by the 3303 Automatic movement. 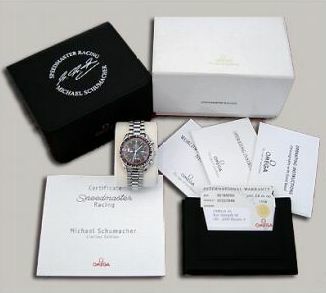 This is the first watch to feature Michaels name on the dial. 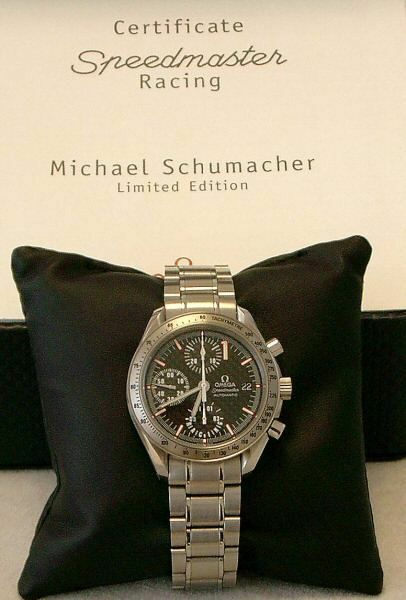 The above picture copyright & borrowed from Omega"
From time to time, people try to sell various Omegas on eBay as Schumacher watches, that I have not covered above. Are they wrong or have I missed them ? As with everything in life the answer is NOT black & white. 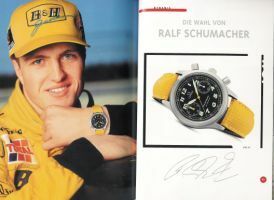 I maintain that these watches are NOT Schumacher watches. They are not marked so & have no paperwork or packaging marked so. 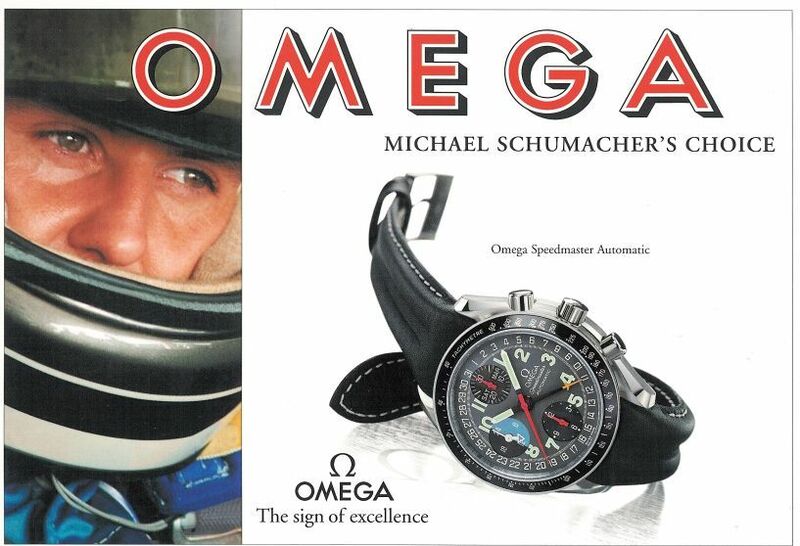 However, over the years Michael Schumacher has advertised a number of different watches for Omega. Here are some examples. I think some people forget, but Michael has a brother, Ralf. 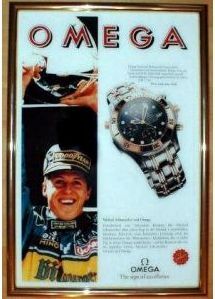 He has also advertised an Omega Watch. Here it is. 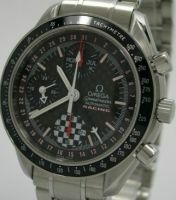 There are also various other racing drivers that have advertised Omega Watches. 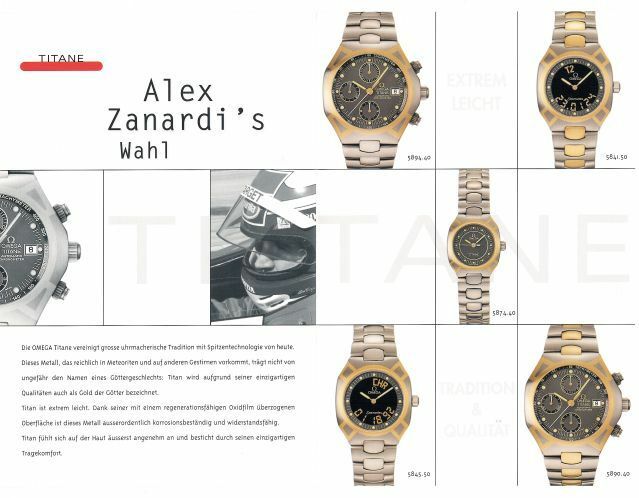 The year before Michael Schumacher was advertising the Titane Range, Alex Zanardi was advertising it. 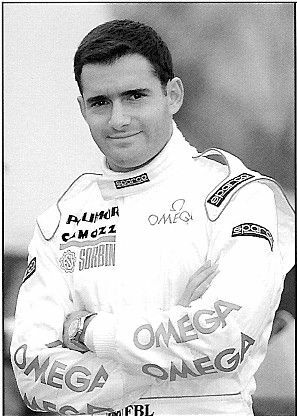 And here are some B/W pictures from inside the 1999 French Catalogue showing ( f-l-t-r ) Michael Andretti, Alex Zanardi, Ralf Schumacher & Gianni Morbidelli. I maintain that there never was a BLUE Schumacher watch. 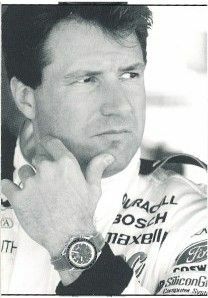 When it was initially released ( 10 February 1997 in New York, with Michael Andretti & Thomas Stafford in a replica of the "Moon Jeep" ) the Blue version, was clearly marked as a "CART" version via a "CART" symbol & chequered flag on the sub-dial @ 06:00. 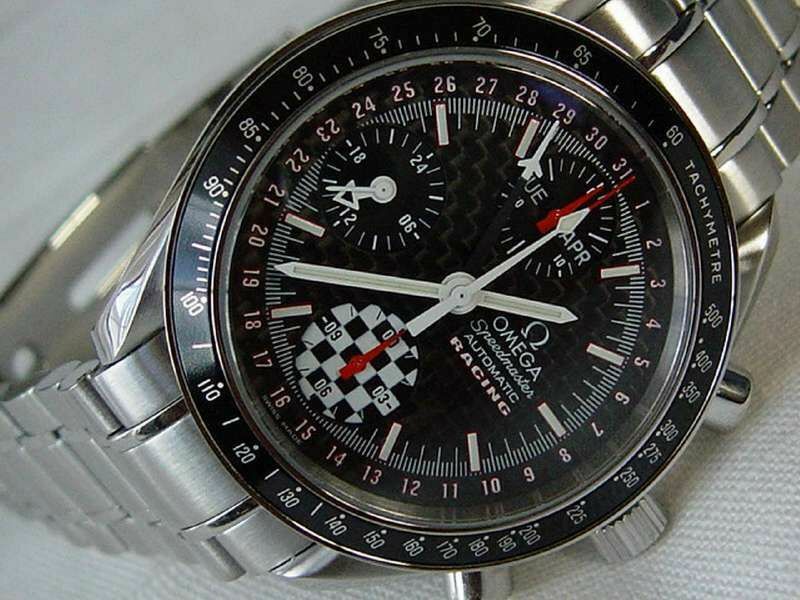 There is no doubting that this is NOT a Schumacher watch. 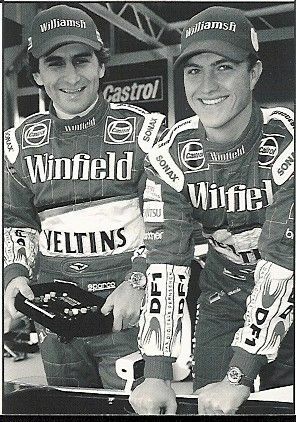 It was advertised by Michael Andretti & although it came in very similar looking Tyre packaging the marking on the tyres was different. ( "CART" Symbol & no Schumacher signature). 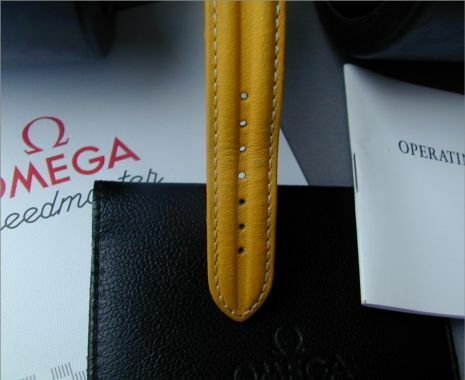 According to Omega SAGA, this watch has an 1143 movement. 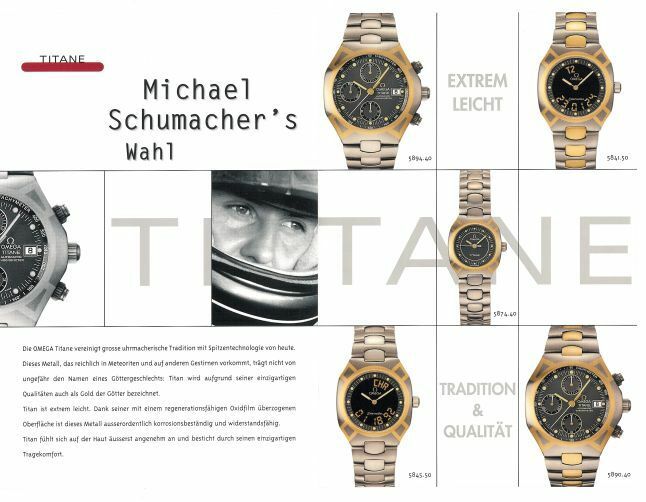 This model was limited to 125 pieces, each piece being individually marked & coming with a certificate The packaging is slightly different. The picture I'm using here came from eBay & not everything shown here came with this watch originally. 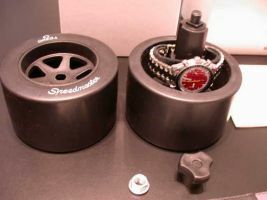 ( e.g the red box, white credit card holder & watch stand), but check out the right tyre. 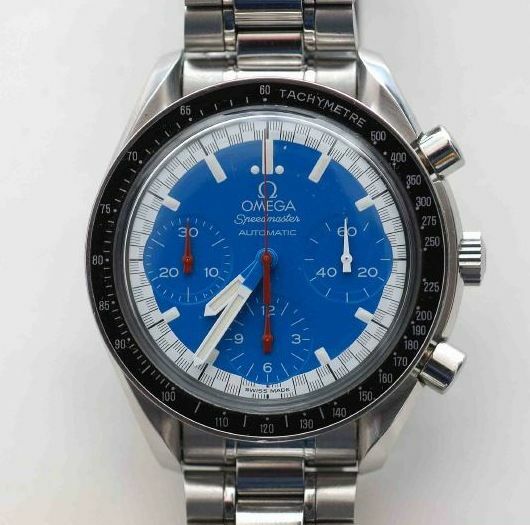 This one is marked "SWISS TIMING"
And, finally, there are Blue Speedmasters available WITHOUT the "CART" logo. ( I have a picture of one on this page). I can hear, you thinking " The Bloody Idiot, has fogotten that one". Again according to Omega SAGA, this watch was released in 1998. 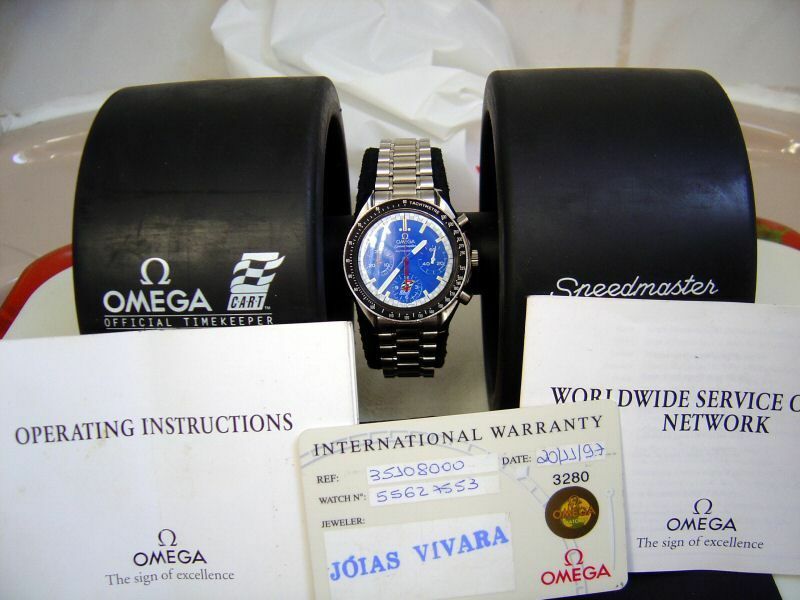 They refer to it as the "Speedmaster Automatic 'CART', with a Blue dial, without Logo". That settles the discussion as far as I'm concerned. 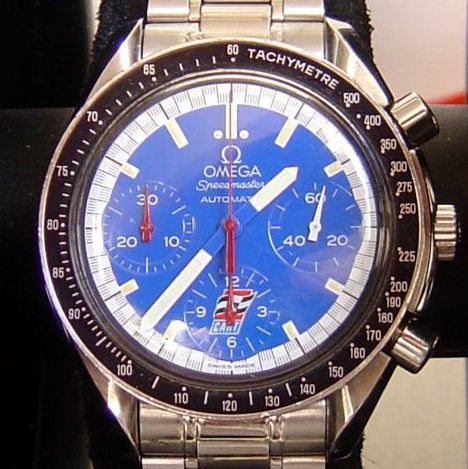 I HAVE seen a picture of Michael Schumacher wearing a BLUE speedmaster, but I still maintain my stance that the BLUE versions are "CART" models & NOT Schumacher models. 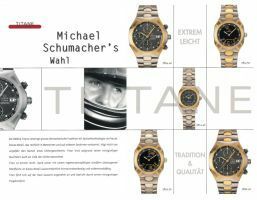 I cannot prove however that Blue Models were sold with or without Schumacher papers. Can anyone provide me with scans of the paperwork that came with the Blue "Cart" models ? Chuck Maddox & Ming Thein.